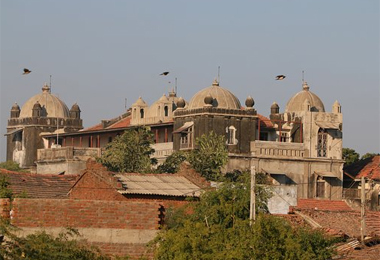 Uetlia ia a small town in the western Indian state of Gujarat. The major attraction of this place is the Utelia Palace. The palace is situated at a distance of 78 Kms from Ahmedabad. This majestic palace exhibits the architectural splendor in its greatly designed premises and has been lately converted in to Heritage hotel featuring a typical local décor that blends well with its alluring ambiance. The palace is beautified by the high pedestals, majestic chandeliers, carved entrances and the spacious dining halls that remind the travels of the grandeur of the past rulers. The palace showcases a typical work of Indo-Saracenic architecture with European influence and has five domes, balconies, porticos and pillared galleries in the palace. The dining halls of the palace can accommodate 32 people at a time and serve the platters of its guest with Indian, Chinese and continental cuisine. While being at Utelia Palace, the heritage hotel one can enjoy activities like Cultural program, Folk dance, Sightseeing tours, Camel safari, Indoor games like Table tennis and Billiards. The Utelia Palace Heritage hotel are the most sought accommodations and booking it through HeritagehotelsofIndia online portal one can avail great discounts.